'How Britain's Air Policy in 1941 Gambled with the Country's Future' – an article by Greg Baughen for History Hit. You'll be £15.00 closer to your next £10.00 credit when you purchase RAF On the Offensive. What's this? Long before the start of the Second World War it had been believed that strategic bombing would be the deciding factor in any future conflict. Then Hitler launched the Blitzkrieg upon France and the Low Countries in 1940, and the much-vaunted French Army and the British Expeditionary Force were swept away in just six weeks. This new form of warfare shook the Air Ministry, but the expected invasion never came and the Battle of Britain was fought in the air. It seemed that air forces operating independently could determine the course of the war. An Army scarcely seemed necessary for the defence of the UK and no British army could ever be powerful enough to mount an invasion of Europe on its own. Bombing Germany into defeat seemed Britain's only option. In North Africa, however, Commonwealth armies and air forces were demonstrating that they too could use blitzkrieg tactics to crush opponents. Britain was also no longer alone; Greece and then the Soviet Union joined the fight. 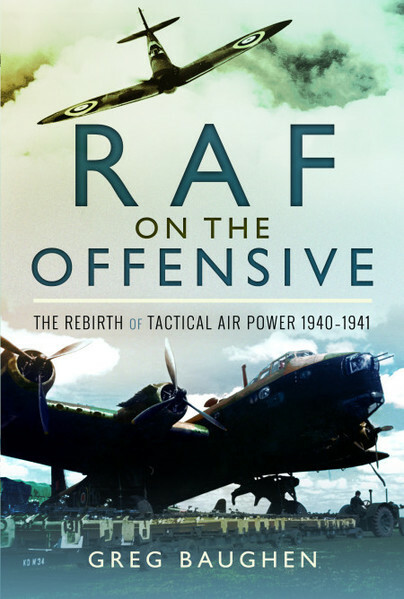 RAF on the Offensive describes how British air power developed after the Battle of Britain. Attitudes were beginning to change – the fighter, rather than the bomber, was re-emerging as the principal means of gaining air superiority. As 1941 drew to a close, the strategic air offensive appeared to be achieving little and conventional land warfare seemed poised to replace it as the way to defeat the enemy. Which direction, then, would the war take? Excellent book! It describes the struggle between the RAF Air Staff and the War Office (Army) regarding tactical air or close support / battlefield air power. The author also discusses the Air Staff’s obstinate efforts to defend the doctrine of “Strategic Bombing” in defiance of all the evidence that it accomplished nothing. Germany conquered half of Europe in 1940 / 1941 with the combination of mobile armored forces in conjunction with ground support from the Luftwaffe yet the RAF persisted in thinking that this was an aberration and an incorrect use of air power. The incredible overestimation's and exaggerations of the effects of supposed “strategic bombing” on German industry are clearly described. In 1939 – 1941 most RAF bomber crews couldn’t even find Cologne or Essen let alone find an individual factory within those cities. I have always found it amazing that strategic bombing advocates, both civilian and military, have always been able to deceive themselves about the effectiveness of bombing on an enemy’s ability and will to resist. For more than a century now, from WW I, WW II, and Vietnam to Afghanistan and so forth, these people always manage to persuade themselves (and quite a few others) that bombing will “win the war.” It is a perfect example of the triumph of fantasy and wishful thinking. An excellent related book on this subject is “Blueprint for Victory” by Baughen (2014). It describes the development and evolution of Britain’s Royal Flying Corp (RFC) in the World War I era 1914 – 1918. It particularly describes the technical development and evolution of the RFC airplanes and the evolution of the tactics associated with supporting the British Army via ground attack (“close air support” in today’s military lexicon, I believe). The author also discusses the diversion of effort to the mystical strategic bombing fantasies in 1916 or 1917 through 1918 – the same arguments preceding those of 1939 – 1941. Greg is masterful at drawing out and showing the almost uniquely British parochial and bureaucratic approach to issues which continues to operate despite the war and the desperate circumstances the country found itself in. The ability to give short shrift to air force dogma is also welcome. This is the fourth of Greg's books that I've read and I'm yet to be disappointed. I don't agree with all that he says but any writing that stimulates thought and discussion is worth reading in my book: no pun intended.